It was after breakfast that we would walk down to the forested area within Venetian Heights (the resort we were staying at) and yet again bask in the sun, collect pine cones, listen to the rustling pine trees and savour the Himalayan breeze and submerge in the sound of silence, far from the maddening metropolis life. As we traipsed into the forest, Laila scampered ahead of us, sniffing around excitedly and enjoying her new found freedom. Aarshia time and again kept waving at Laila’s leash, asking her to be leashed. And we dismissed off her request each time. It came to a point where she almost burst into tears and Alok had to rebuke her for being so stuck up. Arusha was to join us later, as she wanted to spend some time at the Meditation point, writing and spending some alone time. As we reached the forest, we could see the flock of goats grazing at a distance. We walked up to them along with Laila, but the moment Laila saw the goats she stopped short on her tracks. She looked at them suspiciously, as if they were some weird creatures from another planet, and suddenly without any provocation she jumped towards them, and ran after them, chasing them across the other side of the hill. We were stunned, and as we called out to her, hoping she would retreat; we realised she had just disappeared along with the goats. Alok ran after her as Aarshia burst into a river of tears. “I told you.” is all she kept saying. I reassured her that Laila would come back, and that she would be some where around with the goats. Alok and the goat herder had gone looking for Laila and the goats, and Aarshia wouldn’t stop sobbing. I called Arusha who also by now had joined us in the forested hill. We saw Alok coming back, but without Laila. He said neither the goats nor Laila were anywhere to be seen. By now I was also beginning to panic, but holding ground as I realised there was no other way to be, what with Aarshia so uncontrollably inconsolable. My worry was the leopards and other wild animals in the jungle that could instantly prey upon our little Laila. But this was not a time to worry, but to act upon. I called the resort and informed them. One of the attendants, Tikaram from the resort came by and went into the jungle searching for Laila. Alok had again left to look for her in the opposite hill, across the fare way, but there was absolutely no sign, or trace of Laila. We were bewildered and heart broken to say the least, when we got word from the resort that one of the masons working on a construction building of the resort had seen her running on the main road below the hill. He thereafter saw that she had been picked by a bunch of kids travelling in a garland decorated, Maruti and whisked away. Pranay Bose,the manager of the resort who had also become a good friend, advised we should go beyond the Binsar town ship and the Binsar sanctuary and look for her. If the occupants of the Maruti were tourists, they would have gone to the Binsar Wild life sanctuary. We could also check around the nearby settlements and shops. Pranay himself had already left to go looking for Laila along with his men. We followed suit. We scoured the nearby hamlets,looking for a white Maruti 800 with garlands, but with no luck. 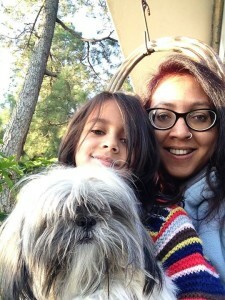 By then we had reached the gates of the Binsar Wildlife Sanctuary where Alok dropped off Aarshia and I, and went off with Arusha towards the Mahendra resort to look for Laila. We asked the guard if he had seen a Maruti with kids, to which he said one such car with kids had indeed gone inside, but he had no clue if there was a dog with them. It was not allowed to take pets inside. Hope seemed to down upon us. Pranay had sent one of his workers in a scooter inside the sanctuary to check, so we waited outside the gates, hoping he would return with good news and Laila. But we were in for no such luck. Pranay also arrived, in his Gypsy and spoke to the person who had gone searching for Laila at the sanctuary and he was told Laila wasn’t there either. Meanwhile Alok and Arusha also returned from hunting Laila, disappointed. It had been almost 5 hours since we had lost Laila and we returned back to the resort heartbroken, full of remorse and regret. While all this was happening, I had texted my prayer and reiki group Connect Ticket on Whatsapp about Laila’s disappearance and everyone in the group had come together to send fervent prayers and positive energies for Laila. The group members, more my extended family, were constantly in touch with me and were consoling me that she would return. But hope seemed bleak now, as we hadn’t found her in the vicinity of Binsar. We were assuming she was taken away in the Maruti 800, beyond Binsar. The boys had the resort were waiting for us with lunch. I could barely eat a morsel and there was a stunned silence between four of us as we sat at the lunch table. I finally broke down. All this while I was holding ground but now, the inevitable seem to have come true. Pranay asked me to send him pictures of Laila so that he could put up posters across the various towns in Almora district and also send it to the local newspapers. That seemed to be our only hope now. We returned to our empty cottage, minus Laila’s warm, excited leaps of greetings. Her uneaten bowl of food lay on the floor and we seemed to be living our worst nightmare this Diwali day of 2014. A shroud of gloom descended upon the otherwise exciting and serene vacation. My prayer group Connect Ticket members kept boosting my moral and sending me texts on not to give up hope and to keep the faith whatsoever. Around five in the evening, as we ordered our masala chai and morosely sat sipping it, we saw Pranay at the door of the cottage with Tikaram, the resort attendant. Pranay grinning hopefully and excitedly informed us, “We might have made some kind of a breakthrough. Laila might be around here, in the vicinity of the resort.” We all jumped off the sofa and the girls squealed with joy. We raced behind him as he escorted us to the resort patio, telling us that their old security guard had informed him that Bipin Thapliyal, owner of the opulent resort opposite Venetian Heights had Laila. Our eyes were twinkling with a new found joy of hope and our excitement knew no bounds. We were relieved that she had not been taken away to any place unreachable and untraceable from Binsar. Hopes of getting her back had been revived. Pranay said, “Please excuse me but I wont be able to accompany you to Bipin Thapliyal, as we aren’t on good terms. So I’m sending Tikaram with you.” That was fine with us, after all Pranay had tirelessly helped with Laila’s search all this while. Tikaram took us to the market next door, where he called the security guard’s son, who had actually found Laila, in the Maruti 800 that had picked her up below the hill. The car with kids was taking Laila away, and this guy on a whim told them, “That’s my dog, you can’t take her away.” To which they had reluctantly parted with Laila. The security guard’s son had the bought Laila home and fed her biscuits and milk. 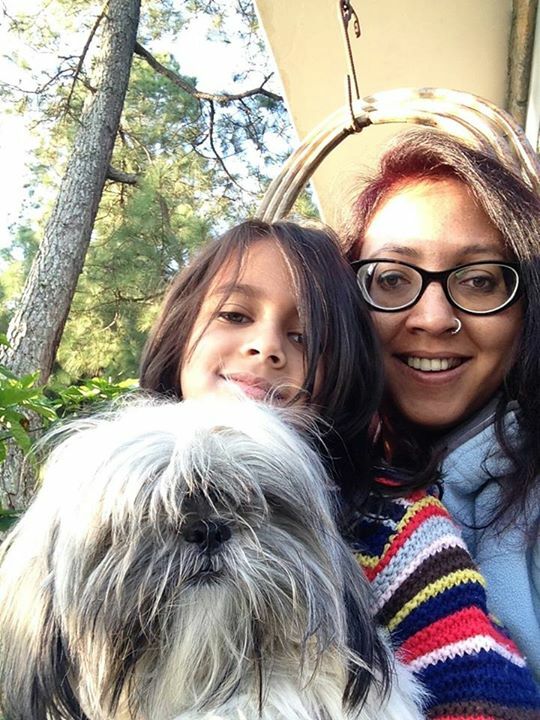 His kids were excited to find a furry little dog amidst them and they had all pampered her; till they received a call from Bipin Thapliyal claiming it was his dog,and asked her to be returned. Nobody in the locales of Binsar liked to engage with Thapliyal in any conflicting manner. He was a well-connected man, a mafia of sorts and capable of giving one a very hard time if he so deemed fit. The security guard’s son, Tikaram and Alok, my better half went to Thapliyal’s mansion. We were asked to stay put at the market next to Thapliyal’s mansion and also across Venetian Heights. Apparently the security guard’s son upon seeing Thapliyal just went quiet. Alok did all the talking and asked him if he had seen Laila, our furry shitzu who had gone missing since morning. Bipin denied knowledge of any such dog. They returned toinform us of Thapliyal’s statement. But we weren’t giving up so easy. Arusha, Aarshia (my daughters) and I decided to go have a word with him. When we approached Bipin Thapliyal he was having his evening tea, in his grand patio and with a charming, yet sinister smile he offered us to join him for tea. We declined saying we were looking for our dog. Arusha took out her phone and started showing him Laila’s pictures and videos. Thapliyal completely feigned ignorance and said that if he found her he would let us know. We felt let down, knowing he had Laila somewhere inside his resort mansion, held captive and traumatised. With all these positive thoughts and wishes I went upstairs to the bedroom of the cottage and started meditating for Laila’sreturn. I opened Goddess Kaali’s picture on my phone and prayed to her, asking her to send Laila safely back, into our arms. As I was visualising all this, at that very moment Lo! Behold!! I heard Arusha from downstairs, in the living room of the cottage, shout, “Lailaaaaaaaaaaaa!!!!!! !” I raced down the stairs, to find Bipin Thapliyal holding Laila in his arms, surrounded by two of his honchos. It was like a dream come true. Best Diwali gift ever, ever. He handed over Laila to me who looked shabby and tired with thorns sticking all over her otherwise smooth furry coat. Her hair band, clips that held her ponytails were gone and she looked scruffily untidy but more than happy to see us. My heart was beating faster than it ever had. Thapliyal then said, “ I couldn’t bear to seethe sad faces of your children. So I sent my men looking for your dog in the village. We found her there and paid 3 grand to retrieve her.” Of course he was fibbing, after all how could he come clean that it was he who had kidnapped Laila. But nothing mattered, anymore. Nothing, at all. Laila had returned to the cosy confines of our arms and being, thanks to the innumerable efforts, prayers and reiki energies that poured in from across the globe. This was no less than a miracle and such a surreal one. Thapliyal wanted us to click a picture of him with Laila and us. We obliged, reluctantly yes; but then that was a meagre price to pay for his change of heart. Chitra and Shruti’s words had come true!!!! I called Sridhar to tell him Laila had returned to which he said he had sent reiki to Joshi and spoken to him to return Laila back. Joshi had initially been reluctant but for the sake of the kids happiness he had given in. Pranay, Tikaram and all the staff at Venetian Heights came to look up Laila. Our hearts were singing and our eyes were sparkling brighter than ever. All the combined efforts to trace Laila had reaped fruits. So, we indeed brought in Diwali dinner with Laila, outside the resort, by a bon fire, bursting some crackers. Arusha decided to break her vegetarian vow and eat chicken, this one time. After all this was a moment to be cherished and celebrated. We still continue to celebrate Laila’s presence in our life. And every time she looks into our eyes those melt-your-heart eyes,shadowed by the mop of ponytails, we give gratitude to the guy up there and all the wonderful people who made it possible for Laila to return, back into our lives. Next morning was spent in meticulously removing a hundred thorns from Laila’s coat. Alok sat her on the bed, and as I sipped my morning cuppa, my heart simply welled up in gratitude and more gratitude. Thereafter I gave her a nice herbal shampoo scrub and cleaned her all squeaky clean, tying her trademark pony’s. Laila looked enchanting. After all she is the enchantress of our hearts and will remain so for times immemorial.